Even as Bt cotton invaded Indian fields in the past few years, some farmer groups kept pushing for organic cotton. In 2009-10, production in India propelled world organic cotton production to an all-time high of 241,697 tonnes. But soon, many farmers realised that organic farming takes years of sustained efforts to get full benefits. With no support from government, that favours Bt cotton, many farmers are reverting to chemical farming. Nakka Pushpa was only 22 when her debt-ridden husband committed suicide 18 years ago. The marginal cotton farmer in Damera village in Andhra Pradesh’s Warangal district left her land fallow for the next 10 years. She had no money to buy seeds and farming inputs. In 2004, Sarvodaya Youth Organisation, a Warangal-based non-profit, offered her help provided she kept off chemicals and used non-Bt cotton seeds. Initially, she was laughed at for using cowdung and urine, and going for inter-cropping and pest traps. But Pushpa did not give up. Last year, she harvested 1,800 kilograms of organic cotton from her one acre (0.4 hectare) land, besides a few hundred kilograms of lentils, maize, vegetables, and some castor too. “Harvest would have been better had it not been a drought year,” she says. She is happy with the drastic cut in cost—from Rs 10,000 during chemical cultivation to only Rs 3,600. Last year, she earned Rs 20,000, cleared all her husband’s debts and is building a small house in place of her hut. Pushpa’s tiny success story is part of an encouraging big picture. In the past few years, India has become the world leader in organic cotton production. Nearly 200,000 farmers have turned organic, although Bt cotton still accounts for nearly 95 per cent of cultivation in the country. In 2002, government had allowed commercial cultivation of genetically modified cotton. The area under Bt cotton increased steeply from a few thousand hectares to 9.5 million ha in 2010, increasing consumption of chemical pesticides and fertlisers as well. Estimates, including those of Food and Agriculture Organisation, say an acre of non-organic cotton cultivation can consume up to six litres of pesticides and 500 kg of fertilisers. This not only diminished land productivity but also led to health problems. But the organic movement began despite the problems. Efforts by farmers’ groups and non-profits gave the required push. The first farmers’ group to export organic cotton—Vidarbha Organic Farmers Association (VOFA)—was formed in 1995. Around the same time, non-profits in Vidarbha like Dharamitra and Chetna Vikas created indigenous knowledge banks by documenting the practices of tribal farmers. Farmer-driven experiments in organic cotton cultivation also started in different regions in the early 1990s. This was expected because cost of chemical cultivation had been rising. Slump in yield after the initial spurt brought on by high yielding hybrids and chemical inputs made matters worse. In mid-1990s, pioneering farmers like Bhaskar Save and Kantilal Patel in Gujarat and Manohar Parchure, Anandrao Subhedar and Raosaheb Dagadkar in Vidarbha in Maharashtra created successful organic cotton cultivation models. They were all inspired by the books of Japanese organic farming guru Masanobu Fukuoka, but had to develop indigenous techniques and knowledge. In 2000, Central Institute for Cotton Research released a first-of-its-kind report on organic cotton cultivation. Several researches followed. None reached farmers. Public programmes like Integrated Pest Management have existed since 1965, but government did little to pass on its benefits to farmers. In Andhra Pradesh, M S Chari, cotton scientist from Centre for World Solidarity, introduced the concept of non-pesticide management among marginal Dalit farmers of Warangal and Adilabad districts and followed it up with the concept of sustainable agriculture in 2001. Private companies like Maikal Bio-Re, Appachi Cotton, Pratibha Syntex and Ecofarms also began contract farming with the farmers of Maharashtra, Madhya Pradesh and Odisha. Despite an overwhelming majority of Bt cotton farms, the factors combined to boost India’s organic cotton production, and eventually global production, to an all-time high in 2009-10. From 57,731 tonnes in 2006-07, the world’s organic cotton production soared two-and-a-half times to 145,872 tonnes the next year. By 2009-10, it saw a stupendous fourfold jump to 241,697 tonnes. India accounted for 68 per cent of world organic cotton production in 2008-09. The share rose to 81 per cent in 2009-10 (see ‘India the biggest contributor’). Around 2006, big international retailers began to turn organic. A 2007 report by UK-based Soil Association showed that retail organic market was valued at US $4 billion. Organic cotton accounted for a large chunk of it. Swedish multinational H&M started blending organic cotton in its products. In 2006-07, companies like C&A, Eileen Fisher and H&M reported stronger than expected sale in their organic portfolio. Twenty-five companies, including Walmart, Nike, Woolworth’s South Africa, Coop Switzerland and C&A, consumed 75 per cent of global organic produce. A report on organic cotton by Textile Exchange, a non-profit which works to extend textile sustainability across the globe, states that from US $300 million in 2001, sale of organic clothing had reached $2 billion in 2007. And, India was a major player. It overtook Turkey as the biggest producer and exporter of organic cotton. However, farmers recieved no support from the government. What kept them going was premium that private companies gave over the government’s minimum support price (MSP). MSP of long staple cotton had been raised from Rs 2,030 to Rs 3,000 per 100 kilograms in 2008-09, while that of medium staple cotton went up from Rs 1,800 to Rs 2,500 per 100 kilograms. “Organic farmers were getting a huge 25 per cent premium over MSP,” says Kamal Kishore Dhiran, farmer of Palodhi village in Maharashtra’s Yavatmal district. This apart, organic farming has its own advantages. Under rain-fed conditions, organic cotton flowers twice in a season, says farmer Tilok Chand Bhuria of Khamlai village in Madhya Pradesh’s Khargon district. “Bt, on the other hand, flowers only once a season unless irrigated very well.” Bhuria switched to organic with help from Maikaal Bio-Re six years ago. His cultivation cost has dropped. “In Bt the maximum saving is Rs 5,000 per acre. After converting to organic farming, I can save Rs 10,000,” he says (see ‘Organic v chemical’). Additional income for organic farmers comes from intercropping. In Pandhurna village of Yavatmal, Kawdu Punwatkar harvests 150 kg of lentils, vegetables and jowar, besides 200 kg of cotton from his one-acre farm. Jaswant Singh Chauhan in Amlatha village of Khargon, who switched to organic a few years back, says his farm’s soil is now better and conserves more moisture. “In the past two years, I harvested 30 kg more cotton, besides lentil and jowar.” Organic cotton seed is an untapped source of income. “It is high in demand for its fodder value and fetches thrice the price of Bt cotton seed,” says farmer Subhash Kamdi of Madni Dindora village in Wardha. Kamdi sells seeds generated from his 2.5-acre organic cotton plot for Rs 30 per kg. Most organic farmers operate in groups formed by non-profits or exporters. Being part of a group has its benefits. Farmers are spared the entire cost and effort behind the complicated certification process, says Rajeev Baruah, director of Maikaal Bio-Re. “Certification costs Rs 500 per farmer. There are additional administrative and field costs. Group certification makes it easy for farmers and us,” he says. Organisations also bear the cost of transport and ensure transparent weighing, which is handled by farmer cooperatives. Since cotton is collected from villages, farmers do not have to pay market cess or shell out money to touts and middlemen. A farmer saves at least Rs 300 per 100 kg, estimates Arun Chandra Ambatipudi, executive director of Chetna Organics, a non-profit that promotes organic cotton cultivation in Andhra Pradesh. “Chemical farmers have to pay these extra expenses and end up earning less,” he says. 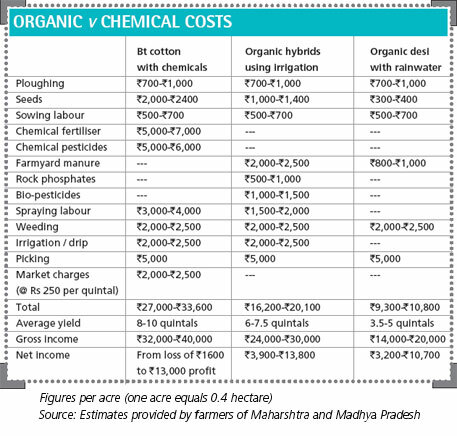 This year in Andhra Pradesh, chemical farmers got Rs 3,600 per 100 kg while organic farmers earned Rs 3,900, as much as the MSP. But the curve of India’s organic cotton production reversed in 2010-11. Production dropped by a steep 47 per cent although India maintained its world lead with over 60 per cent share. India, which had flushed the global market with its organic cotton, created a glut of sorts. At this time, the German edition of Financial Times published a report in early 2010, titled “Label Scandal”. It stated that global clothing brands such as H&M, C&A and Tchibo were selling clothes made of Bt contaminated organic cotton. These brands were sourcing organic cotton from India. Sanjay Dave, the then director of Agriculture Processing and Exports Development Agency (APEDA) in India, admitted that organic cotton was getting contaminated “on a gigantic scale” in the country (see ‘Farmers on shaky ground’). Mani Chinnaswami of Tamil Nadu-based Appachi Cotton says the scandal, along with more complaints of contamination, reduced India’s cotton prices. “Besides, European economy was reeling from recesssion. Introduction of alternative initatives that did not insist on cotton grown with less pesticides and water, also gave competition to the expensive organic cotton,” he says. The sharp cut in prices trickled down to the farmers and the premium that private companies were giving them crashed drastically. In the past two years, companies like Ecofarms have not given any premium to farmers. Earlier, says Dhiran, the company paid 10 per cent or more. This year, Maikal Bio-Re has fixed premium at Rs 460 per 100 kg, while Pratibha Syntex is giving Rs 100 over the market rate. The biggest hurdle before organic cotton is that in the absence of a domestic market, it is entirely dependent on the vagaries of the international market. Organic groups are finding it increasingly difficult to market their cotton. Much of the produce has to be sold in the open market. “We have the potential to produce 1,700 tonnes of lint a year. Of this, we can market only 800 tonnes. The rest is sold to Cotton Corporation of India,” says Ambatipudi. Farmers have to bear the price cuts. The good news, however, is that the international market is likely to revive soon, says Prabha Nagarajan, India representative of Textile Exchange. “Many big brands and retailers have indicated continuation of organic cotton programmes as part of their sustainable cotton initiatives,” she says. D P Arya of Pratibha Syntex, Indore, world leader in organic textile manufacturing, says buyers in the UK and the US are again taking interest in organic cotton. While organic cotton, like any other market product, is subject to market laws governing demand and supply, commerce cannot be the only determining factor governing its future. Crucial factors like sustainability, farm economics, ecological balance and soil health must be taken into account. Formulating right policies to provide support farmers’ initiatives will go a long way in the evolution of organic cotton. It takes years for organic farming to show results. While many make sustained efforts to get its full benefits, some withdraw. Eight years ago, farmer Kishor Bobde survived a suicide attempt. 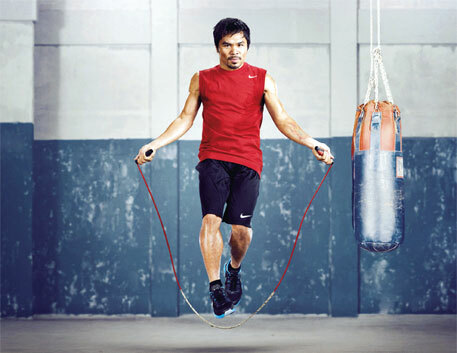 The reason for his extreme step was not Bt cotton. The shift from chemical to organic farming was too difficult for him to handle. “It took very tense six years to bring yield to the pre-organic level,” says his wife Anita. The couple lives in Pandhurna village of Maharashtra’s Yavatmal district, the world’s largest organic cotton-growing region. Many organic farmers do not know what to do and what to expect, says Arti Pankharaj of Centre for Sustainable Agriculture, working on organic cotton in 30 villages of Wardha, Maharashtra. There is no exact science that can tell farmers how many years and how much input it will take to wean the land away from chemicals and get full benefits. A 2002-03 study by National Bank of Agriculture and Rural Development (NABARB) with organic farmers of Yavatmal states that production drops to half in the first year of conversion. The next three years, farmers have to face losses. It takes six years for farms to recuperate. According to protocols devised by the Punjabrao Deshmukh Krushi Vidyapeeth, Akola, it takes at least 10 years and high doses of farmyard manure for land to recover. “Unless there is a definite level of predictability regarding input-yield ratio, farmers will not feel safe,” says Pankhraj. CHARACTERISTICS: Resistant to drought, excess water, pest. Low input, irrigation requirement. Assures moderate production. AMERICAN COTTON: Brought to India before Independence to enhance production. Its species is G Hirsutum. BT: Bt gene is added to hybrids. Organic farmers feel helpless because they get no hand-holding from the government, says Arun Chandra Ambatipudi of Chetna Organics, non-profit that promotes organic cotton cultivation in Andhra Pradesh. “Government policy on subsidy is skewed in favour of everything related to cotton except organic farming,” he says. Chemical farming is heavily subsidised. Their is no subsidy on composting or on farming inputs. A large part of the country’s cotton cultivation is Bt. Considering this, farmers find it difficult to maintain the mandatory 30-50-metre distance from Bt farms. Small farmers say isolation is difficult because organic cultivators are few and scattered. A 2008 study in Andhra Pradesh and Gujarat by the Centre for Sustainable Agriculture (CSA), Hyderabad, failed to find a single seed-production plot that was maintaining the stipulated distance. Many farmers have reverted to chemical farming because they could not maintain the distance. Chetna Organic alone lost 320 of its 500 members. “Now, there are so few organic farmers that isolation is impossible,” says Anandrao Subhedar, president of Vidarbha Organic Farmers Association (VOFA). Many farmers registered with private companies are not even aware that keeping the distance is essential. Ecofarms director Omprakash Mor says his company encourages farmers to maintain 10 metres of distance. “Buyers insist more on right seed than on distance,” he says. Controlling reckless spread of Bt cotton is the most crucial policy support the government can provide, say people associated with non-profits. The National Fiber Policy that was initiated last year recommends creation of zones for organic cultivation, but does not say if the zones should be in conventional cotton areas or elsewhere. “Such an approach will eventually push organic and speciality cotton into non-conventional niche areas,” says Ambatipudi. In fact, most of the organic cotton initiatives were not taken up in conventional cotton areas, says G V Ramanjaneyulu, agriculture scientist with CSA. They replaced food crops in malnutrition-prone areas among tribal and dalit smallholders. Now, Sundarbans in West Bengal, and Odisha are facing this, he says. The phenomenal rise in cotton acreage post-Bt is entirely at the cost of food crops. “To address this we need urgent policy steps limiting cash crops to not more than 50 per cent of the cultivated area and reserving acreage for non-Bt cotton,” he says. Andhra Pradesh has started awareness programmes and comparative studies on yield and pest infestation in Bt and non-Bt crops, says Nagi Reddy, former state principle secretary, agriculture. S S Patil, senior cotton breeder at the University of Agriculture Sciences, Dharwad, says government should take policy initiatives to create patches of organic cotton in Bt areas, and seed companies like Monsanto should pay for this because it is essential for the survival of their technology. It is a constant warfare to access non-Bt seeds, say farmer groups. Farmers want indigenous, or desi, seeds because they do not get contaminated by Bt cotton. “Desi cotton is an easy solution to the problem of contamination,” says K R Kranti, director, Central Institute of Cotton Research (see ‘Cotton types’). But supply is erratic, says Tilok Chand Bhuria of Khamlai village in Madhya Pradesh’s Khargon district. “Last year, Ankur Seeds introduced a desi hybrid called Swadeshi-5. It was out of stock before we could get any. This year it is not available.” He has bought desi hybrid Ambika-12 marketed by Nirmal Seeds. “I got 1,200 kg per acre (0.4 hectare) yield. Many farmers in my village want the seed but no one knows if it will be available next year,” he says. H D Kote, a taluka in Mysore district, is a major cotton cultivating region in Karnataka. Of the 45,000 hectares under cotton in the district, H D Kote covers 15,000 ha. Of this, 2,000 ha is for organic cotton. Farming itself is highly risky affair here, say farmers. The area falls in the buffer zone of the Nagarhole and Bandhipur national parks in the Western Ghats. Crops are always at the risk of being destroyed by animals. “We turned to cotton because elephants don’t eat it,” says L N Rama Rao, a 70-year-old organic farmer of Chakahalli village. There are water woes, too. The taluka has four reservoirs, but only one of these has water. Farming, therefore, is dependent on rains. Earlier, farmers used chemical-intensive method to grow cotton. “But costs kept escalating. Most of us were in the grip of middlemen and moneylenders. Besides, our health was deteriorating. Many of my relatives are cancer patients. So we decided to switch to organic farming,” says Mahesh M of the village. “We make efforts to keep the soil healthy and protect the Western Ghats’ rich biodiversity. But we get no recognition or support from government,” says Chandrasekhar of Savayava Krushika Sangha, organic farmers’ cooperative society. Instead, efforts are being made to grow Bt cotton in the area. President of Cotton Association of India (CAI), an organisation of conventional farmers, traders, ginners, spinners, brokers and textile mills, has written to the Ministry of Environment and Forests, saying cultivation of GM crops should be allowed in the Western Ghats. The letter follows a recommendation by the Western Ghats Ecology Expert Panel which states that Western Ghats is an eco-sensitive region and cultivation of GM crops should not be allowed. CAI’s letter further suggests that no action is needed to supply non-BT cotton seeds to farmers. Farmers register their demand for non-Bt seeds at the market. But the demand rarely reaches big companies. Companies slink away by saying there is no demand for non-Bt seeds. Farmer goups complain that seed companies have stopped producing non-Bt cotton even for refugia. Refugia is essential to plant during Bt cultivation for pest control. Many companies supply poor quality seeds for refugia so the germination rate is abysmal. “Failure of refugia plantation is responsible for both non-Bt seed crunch and the rate at which Bt has developed pest resistance,” says Patil. According to the Genetic Engineering Approval Committee guidelines and the Ministry of Environment and Forests notification, Bt farms must be surrounded with non-Bt crops as refugia. Organic farming groups lament there is no mechanism for procurement. “The Cotton Corporation of India does not give any recognition to organic cotton,” says G John, secretary of Pragathi Seva Samithy, farmers’ cooperative in Andhra Pradesh. Many farmers who have stopped organic farming say they were forced to do so because of the seed crunch. In Vidarbha, for instance, organic farming groups like VOFA almost collapsed because of non-availability of seeds. VOFA was formed in Yavatmal district with 135 member farmers. “Barring the veterans, barely a handful of farmers in Vidarbha are now growing organic cotton,” says VOFA member Kaka Uttarwar. In 1947, the area where desi cotton was grown accounted for 92 per cent of the total cotton area. It has dropped to five per cent. Farmers have become heavily dependent on private companies for seeds. The need of the hour is technology development, says Patil. “There is hardly any hybridisation technology in desi cotton because the processes of emasculation and crossing are difficult and seed companies are only interested in hybrids,” he says. For organic cultivation, there is a need to identify Indian genotypes suited to an organic situation in low rainfall areas. 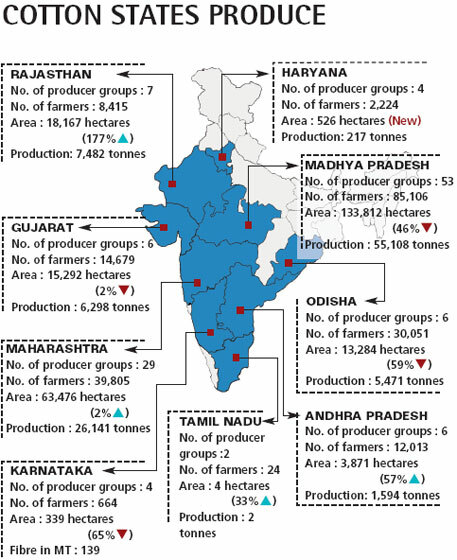 Indian universities have a vast germplasm collection, but experts say it will take long for assured supply of region-appropriate seeds to become a reality. Maikal Bio-Re is also testing seeds for regional suitability, says the company’s research manager Rajeev Verma. However, it will take time to develop suitable seeds, he says. Organic farmers also have to face accute shortage of farmyard manure and organic pest repellants. “In Akola and other parts of western Vidarbha, the number of cattle has dropped drastically due to drought and deforestation. Farmers have to buy inputs, which increases the cost,” says B R Patil, cotton expert at Punjabrao Deshmukh Krushi Vidyapeeth, Akola. Farmer K Somuji of Saketa village in Adilabad has to buy two tractors of cowdung every year. Inadequate input impacts the yield. When the yield is not up to mark, farmers return to chemical farming. Low yield combined with small sized bolls sends picking wages shooting up. 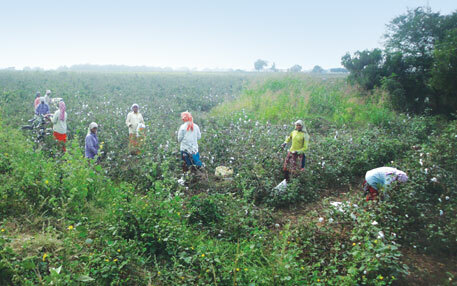 “Between 2008 and 2012, wages for cotton picking have gone up from Rs 1.50 a kg to Rs 10 a kg,” says Ambatipudi. In desi cotton, bolls are downward facing. Unless picked at the right time, cotton tends to fall off the bolls. Even a slight labour crunch could leave the farmer with a big loss. There is also a crying need for research on effective botanical and biological pest repellants. At present, farmers operate with neem and plant extracts. During pest attacks, these act much slower than chemicals. Cotton accounts for five per cent of the country’s cultivated acreage. Given the input-intensive manner in which cotton cultivation has evolved, it is today the most difficult crop to manage in an organic situation, says Patil. Concentrated efforts by the government and agricultural universities could help farmers emerge from the challenge of organic farming. A year earlier, 100 per cent certified organic clothes were introduced by designers Rogan Gregory and Mackinlay Hann through a range of casual wears called Loomstate. A pair of jeans from this lineup cost US $240. About the same time, Walmart introduced 100 per cent organic clothing under the label Sam’s Club. The prices began from US $10. Eco-style had, indeed, become a part of the growing concern for the planet. At the crux of all this was the downy and supple fiber called cotton. And the reasons were not hard to understand. While only 2.4 per cent of the world’s cropland is cotton, it consumes about 24 per cent of the global sales of pesticides and insecticides. About 20,000 litres of water is required to produce a kilogram of cotton, enough for a pair of jeans and a shirt. The uncomfortable facts that were shrouded by this comfortable cloth were laid bare. Going organic, says Prabha Nagarajan of Textile Exchange, is like setting the Gold Standard. But for that, numerous sustainability and certification efforts have to be made (see ‘Making a difference’). These range from promoting partial organic clothing to minimal use of chemicals and water. Big brands like H&M, Adidas, Levi Strauss and IKEA have joined the international non-profit Better Cotton Initiative (BCI), which works with local organisations. It teaches cotton farmers simple farming techniques that increase productivity and profits while reducing use of chemicals and pesticides, and water. It tells them how to set up irrigation systems, and plant border crops throughout the growing season. It works with about 35,000 farmers in Punjab, Rajasthan, Gujarat, Maharashtra and Andhra Pradesh. 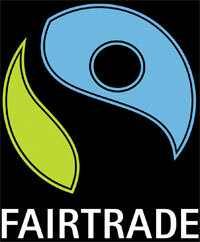 Fairtrade International is active in Brazil, Burkina Faso, Cameroon, Egypt, India, Kyrgyzstan, Mali, Nicaragua, Senegal. It covered 58,468 farmers in 2011-12. 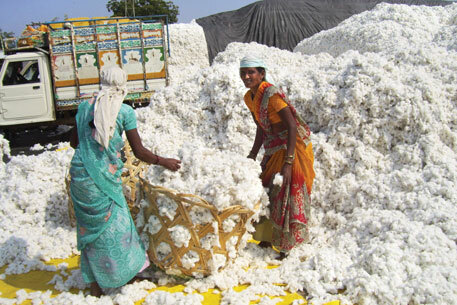 The non-profit sold 8,233 tonnes of lint cotton in 2011. The estimated premium Fairtrade paid to farmers in 2011 was €1.1 million. Of this, 19 per cent was organic. About 97 per cent of the Fairtrade cotton comes from India, Mali and Senegal. BCI operates in Brazil, India, Mali, Pakistan. It is by far the biggest initiative, encompassing about 68,600 farmers. BCI is GMO-neutral and promotes integrated pest management, which requires more conservative application of pesticides and fertilisers. BCI focuses on improving the efficiency of irrigated water supplies and addresses labour issues by complying with labour standards set by ILO. GOTS is not an initiative, but standard for textile. 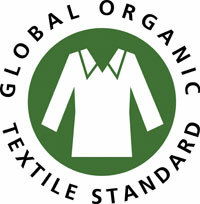 A textile product carrying the GOTS label grade ‘organic’ contains a minimum of 95 per cent certified organic fibres whereas a product with the label grade ‘Made with organic’ contains a minimum of 70 per cent certified organic fibres. Chemicals including dyes and auxiliaries meet certain toxological and environmental criteria. For processors, a functional wastewater treatment plant is mandatory. The sustainable cotton community worldwide has grown tremendously over the past few years. BCI commands a membership of close to 200 members, which includes producer groups, processors, retailors and non-profits. Global Organic Textile Standards certification (GOTS) system, which was launched in 2004, certifies textiles with up to 70 per cent organic content. In 2011, GOTS had 2,714 facilities worldwide, most of them Indian. Clara So, director corporate affairs of Levi Strauss Asia Pacific Division, says the reason Levi joined BCI was that through cotton farming the company can make the biggest difference to reduce the environmental impacts of its products. “We believed it can change the way cotton is grown around the world, positively impacting the environment and supporting 300 million people engaged in cotton farming around the world,” she says. The company has started integrating a blend of cotton grown through BCI into about two million pairs of Levi’s and Denizen jeans in their Fall 2011 product lines which are in stores around the world and another 25 million pairs of jeans and khakis, So says. Levi’s now has a goal that of all its procurement, 15 per cent will be from BCI. Global sportswear giant Nike which began blending organic cotton into its sportswear as early as 1998 has become the third largest procurer of organically grown cotton in 2011. The same year it also set a target that by 2020 it will only procure sustainably grown cotton. Fairtrade premium for Indian farmers is Rs 360 for 100 kg of cotton. The minimum price for 2013 ranges from Rs 2,800 per 100 kg for non-organic short staple cotton to Rs 7,200 per 100 kg for long staple varieties grown organically. 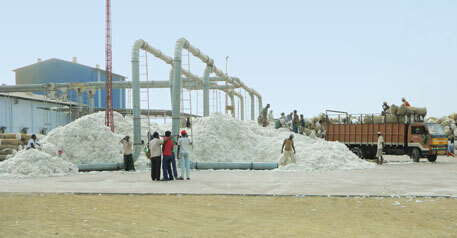 At present, the company pays premium to around 2,000 farmers producing Fairtrade cotton in Gujarat. Parker says that Fairtrade premium has helped Gujarat farmers in many ways. They now have money to buy vegetable seeds which they can grow in their kitchen gardens. The farmers of Gujarat invest the premium in solar rechargeable lamps and torches, claims Parker. BCI takes a top down and bottom up approach. While the consortium of apparel companies put pressure on its supply chain to guarantee a market for better cotton, BCI also works in partnership with non-profits like Solidaridad Foundation to train farmers to meet their demand. According to So, one of the goals of BCI is to make cotton farming more sustainable without creating a niche market that drives up prices and makes it unaffordable for consumers. That’s why BCI has asked brands to hold off on direct product labelling during this start-up phase. Keeping this philosophy in mind, BCI also does not pay farmers additional premium for being eco-friendly. Yet, those who work with the organic community say that companies must do the full monty instead of just trying to reduce the use of chemicals and water. Arun Chandra Ambatipudi, executive director of Chetna Organics, says although BCI is growing fast, questions on the way it works will be asked sooner or later. For instance, BCI stresses on reduction of water use. It is common sense to ask how can water use be reduced when Bt hybrids and chemicals are being used. BCI definitely cannot be the substitute for organic cotton. According to Nagarajan, initiatives like BCI engage cotton producers with environmental and social practice while cultivating genetically modified cotton. “We only hope that some of these groups see it as a stepping stone towards going organic given the favourable market conditions,” she says. Is Bt cotton a success or failure? There is a need to present public what is the net profit under Bt-cotton, hybrid with irrigation, desi under rainfed after deduction from government input subsidies, loans, irrigation costs. Then only the real picture of loss or profit with new technologies will emerge. Also, there is a need to give details on export of cotton and who are the beneficiaries -- farmers or politicians and or businessmen nexus. Are the farmers getting minimum support price? But didn't the last article in DTE quote someone saying say BCI was a bit of a hoax? i.e. the Cariappas from H.D.Kote? "What do you think about the Better Cotton Initiative (BCI)? It is a complete deception. To know the truth about it find out which agencies are funding BCI. The funding agencies are idealistically hollow because they have to depend on corporate companies for money. I strongly believe the aim of BCI is to kill the organic movement and pave an easy way for GM crops and foods. At present, the only threat/opposition to GM crops in the field and market is the organic movement." This is a good article showing plus & minus of organic forming. In fact an initiative is required from government agency for sustainable development of India and public at large. Indeed scientists are not playing their role very honestly because of short-term gains. Unfortunate. More detailed research is needed. Orgainc farming will also help in saving our germplasm. Beleive it, in coming years every farmer might be forced to purchase every kind of seed at very high cost. I was happy to read this news that High-end clothing brands are turning organic. I also agree to Dr. S. Jeevananda Reddy for his comment that it is needed to give details on export of cotton and who are the beneficiaries -- farmers or politicians and or businessmen nexus.